Catalytic, asymmetric, intramolecular carbon-hydrogen insertion involves the internal reaction of a carbon-hydrogen bond with a metallocarbene. The latter is typically generated from an α-diazocarbonyl compound and a chiral, enantioenriched transition metal catalyst. Insertion of the metallocarbene carbon into the carbon-hydrogen bond establishes new C–H and C–C bonds in a stereocontrolled manner. In the presence of catalysts containing copper, rhodium, and other transition metals, diazo compounds substituted with carbonyl groups will form metallocarbene intermediates. These reactive intermediates may then take part in cyclopropanation or σ-bond insertion reactions, which result in the formation of two new bonds at the carbon of the metallocarbene. From the organic chemist's perspective, insertions of metallocarbenes into C-H bonds are particularly attractive transformations. Such reactions have the potential to establish a new stereocenter with high atom economy and stereoselectivity controlled by the nature of the transition metal catalyst. Intramolecular C-H insertions are perhaps the most well developed σ-bond insertions of metallocarbenes, and have been known for several decades. 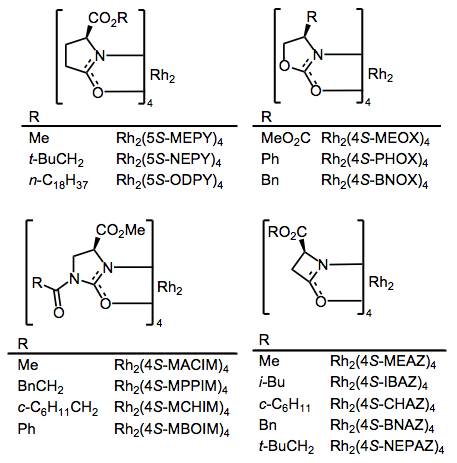 A plethora of asymmetric variants that establish chiral five- or six-membered rings with high stereoselectivity have been developed (Eq. 1). Many different metals are known to form metallocarbenes in the presence of diazocarbonyl compounds, but only rhodium(II) complexes yield carbenes that undergo predictable C-H insertion reactions. Dirhodium tetracarboxylates and related complexes with bridging LX-type ligands have emerged as the best catalysts for stereoselective C-H insertion. Eq. 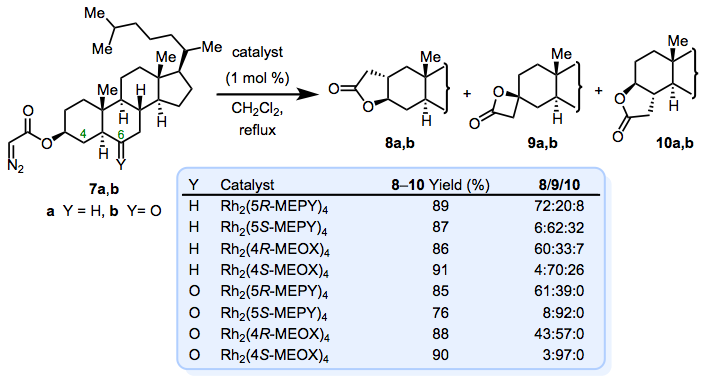 2 provides an overview of the most common rhodium catalysts employed in intramolecular C-H insertion reactions. These ligands are derived from amino acids. The axial positions of dirhodium tetracarboxylates are typically occupied by two dative ligands, which bring the total electron count of each rhodium center up to 18. To form an active catalyst that can react with the α-diazocarbonyl compound to yield a metallocarbene, one of these dative ligands must dissociate. Upon ligand dissociation, a 16-electron rhodium center results, which can react with the diazo group to form a diazonium complex. The rate-determining step of metallocarbene formation is loss of dinitrogen from this diazonium complex, which produces a metallocarbene intermediate (Eq. 3). The carbon of the metal-carbon double bond is electrophilic, and may participate in addition reactions with electron-rich σ and π bonds. An important debate concerning the mechanism of C-H insertion has centered on the nature of the transition state of insertion. The carbene carbon may insert into the C-H bond via a three-center transition state, or the C-H bond may add across the carbon-rhodium double bond via a four-center transition state (Eq. 4). Subsequent reductive elimination from the adduct in the latter case would afford the observed insertion product. A growing body of evidence supports the three-center mechanism over an addition-reductive elimination mechanism. Addition of hydrogen to the rhodium center would require one of the carboxylate ligands to dissociate, but kinetic data do not support dissociation. Computational studies also support a three-center mechanism. The three-center transition state features significant bond making between hydrogen and the carbene carbon, with partial positive charge on the carbon of the C-H bond and partial negative charge on the rhodium center. Carbon-carbon bond formation and carbon-rhodium bond cleavage occur later, but simultaneously, along the reaction coordinate. C-H insertion reactions involving metallocarbenes are generally faster at electron-rich C-H bonds, including those adjacent to oxygen and nitrogen atoms that can stabilize developing positive charge. The rate of C-H insertion is also influenced electronically by substitution, with tertiary C-H bonds reacting fastest, followed by secondary, primary, and methyl C-H bonds. However, steric factors can also be important in the rates of C-H insertion reactions. Secondary C-H bonds that are particularly crowded may react more slowly than nearby primary C-H bonds that are more sterically accessible, for example. Both steric and dipolar effects likely play a role in the observed enantioselectivity of most asymmetric C-H insertions. The "face" of the catalyst pointing toward the incoming C-H bond likely possesses partial negative charge on its periphery, where the carboxylate ligands are located. This "wall" of negative charge causes the negative ends of polarized bonds in the substrate (as well as sterically bulky groups) to point away from the face of the metal catalyst. In the example in Eq. 5, the right-hand transition state is disfavored due to unfavorable dipolar interactions, while the left-hand transition state, which presents a different diastereotopic proton to the carbene carbon, possesses favorable dipolar interactions. Access to the appropriate α-diazocarbonyl compound is a prerequisite for intramolecular C-H insertion. A very common method for the synthesis of diazoacetates involves substitution of an acyl chloride with diazomethane (Eq. 6). An excess of diazomethane or triethylamine should be present to scavenge the hydrochloric acid formed during this reaction. Diazo transfer from sulfonyl azides to enolates is the most popular method for the synthesis of diazocarbonyl compounds (Eq. 7). Strong base is not necessary if the α-carbon is activated with a second carbonyl group, an aryl group, or a vinyl group. Unactivated carbonyl compounds do require the use of a strong base such as LDA, however. Deformylative diazo transfer is a second method for the installation of diazo groups at weakly acidic positions. Detrifluoroacetylative diazo transfer is a conceptually related, more recent alternative (Eq. 8). An initial Claisen condensation acidifies the future diazo carbon, and diazo transfer is effected with weak base under conditions that result in removal of the formyl or trifluoroacetyl group. Direct acylation of alcohols and amines with diketene and subsequent diazo transfer provides a convenient route to diazoacetate esters and diazoacetamides (Eq. 9). Diazoesters (most commonly, diazoacetates) form lactones upon intramolecular C-H insertions. 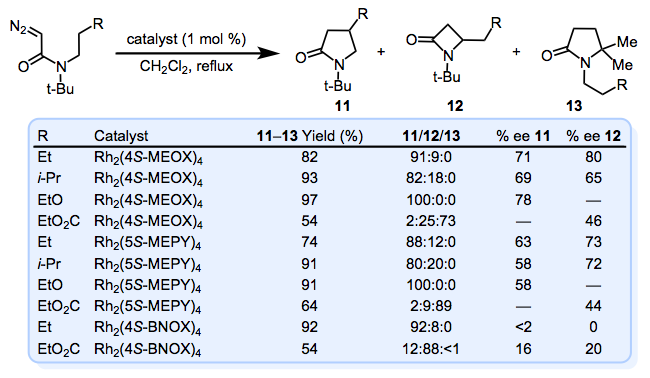 γ-Lactones (five-membered rings) are strongly favored in these reactions (Eq. 10), although in rare cases, β-lactones are observed. The oxygen atom adjacent to the β-position provides moderate electronic activation toward insertion. Changing the ligand set of the catalyst often has profound effects on the results of C-H insertion reactions. A series of experiments with steroid-derived diazoacetates demonstrates this idea nicely (Eq. 11). Changing the ligand set and the enantiomer of the catalyst strongly influences the site selectivity of the reaction. When the 4-position is deactivated by a carbonyl group at the 6-position (Y = O), insertion at the 4-position does not occur at all. Diazoacetamides undergo similar insertion reactions to afford lactams. Unlike most reactions of diazoacetates, β-lactam formation can be a significant problem for insertions of diazoacetamides. The β-position is strongly activated by a good electron-donating group (Eq. 12). For reactions of tertiary amides, conformational effects play an important role in the site selectivity of C-H insertion. Bulky protecting groups are often used to facilitate dominance of the s-cis conformation (Eq. 13). Nonetheless, observed ratios of β-lactam, γ-lactam, and 'tert'-butyl insertion products may depend on the structure of the substrate in subtle ways. 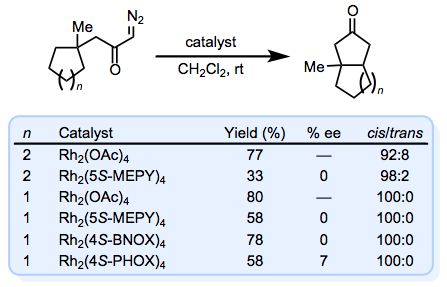 Diazoketones react to afford cyclopentanes in high yields, but suffer from notoriously poor enantioselectivities regardless of the catalyst employed (Eq. 14). Similar observations have been made in applications of diazoketones to cyclopropanation reactions, as well. Cyclopentanes result when the tether between the reactive C-H bond and the diazo group does not include the carbonyl group. Suitably substituted diazoesters have been employed for these reactions with success. The most effective catalysts include phthaloyl-amino acid (PTTL) ligands (Eq. 15). The synthetic advantage of C-H insertion is clear in syntheses of small compounds bearing a single stereocenter. Use of either enantiomer of catalyst in the insertion step provides simple access to either enantiomer of the resulting compound. For example, after acylation and diazo transfer, the use of Rh2(4S-MPPIM)4 established the sole stereocenter in (+)-baclofen with high enantiomeric excess. Use of the opposite enantiomer of catalyst yields (–)-baclofen after the same set of operations (Eq. 16). 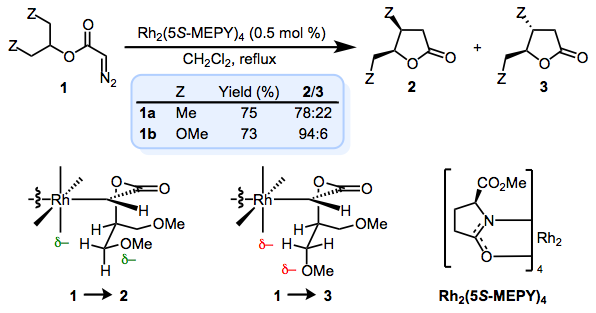 The only currently known method that is directly comparable to rhodium-catalyzed, intramolecular C-H insertion is the intermolecular variant of the reaction, which has been developed more recently (Eq. 17). Intermolecular C-H insertions often suffer from lower yields and more side reactions than comparable intramolecular insertions. Site selectivity is more easily controlled in intramolecular reactions, since ring size plays an important role. On the other hand, intermolecular reactions require less elaboration of the substrates prior to the C-H insertion step. Simple substrates may be employed and the potential for wider scope is available. Currently however, the potentially unlimited scope of intermolecular C-H insertion is limited by the need to use donor-acceptor carbenoids. C-H insertion reactions are typically carried out under conditions that simulate high dilution, to avoid dimerization of the metallocarbene to form alkenes. The diazocarbonyl compound is typically added by syringe pump to a solution of the catalyst. Reactions should be carried out under anhydrous conditions, and it should be noted that Lewis bases in the reaction medium or substrate may interfere with the C-H insertion process by coordinating to rhodium or reacting with the metallocarbene. Care should be taken when handling diazocarbonyl compounds, as they are potentially explosive and toxic. Note that diazocarbonyl compounds are generally more stable than the corresponding diazoalkanes, however. Extra care should be taken when handling sulfonyl azides during diazo transfer protocols, as these have been reported to pose significant hazards. A solution of 4-chlorophenethyl 2-diazoacetate (708 mg, 3.2 mmol) in dry CH2Cl2 (20 mL) was added, over a period of 5 h via a syringe pump, to a refluxing solution of Rh2(4S-MPPIM)4 (22 mg, 0.016 mmol) in dry CH2Cl2 (80 mL). The solvent was evaporated under vacuum and the crude residue was purified by chromatography on silica gel (hexanes/EtOAc = 4:1) to afford the title compound (502 mg, 2.56 mmol, 81%) as a white solid: [α]D26 –50.9 (c = 0.7, CHCl3); 1H NMR (500 MHz, CDCl3) δ 7.33 (d, J = 8.5 Hz, 2H), 7.16 (d, J = 8.0 Hz, 2H), 4.65 (dd, J = 9.0, 7.5 Hz, 1H), 4.22 (dd, J = 9.0, 7.5 Hz, 1H), 3.76 (pent, J = 9.0, 1H), 2.92 (dd, J = 17.5, 9.0 Hz, 1H), 2.62 (dd, J = 17.5, 9.0 Hz, 1H); 13C NMR (125 MHz, CDCl3) δ 137.9, 133.5, 129.2, 128.0, 75.9, 73.7, 40.3, 35.5; HRMS (m/z): [M + H]+ calcd for C10H10N2O2Cl, 197.0369; found, 197.0372. The enantioselectivity was determined as follows: A sample of γ-butyrolactone was reduced with a THF solution of LiAlH4 to give the corresponding diol, followed by treatment with excess trifluoroacetic anhydride to give the bis-trifluoroacetate ester. The ee (95%) was determined by GC on a 30-m Chiraldex B-DM column: tR (R) = 99.6 min, (S) = 100.4 min (flow rate: 1.0 mL/min, oven temperature 100 °C for 20 min, then 0.5 °C/min to 140 °C). ↑ Diaz-Requejo, M. M.; Perez, P. J. Chem. Rev. 2008, 108, 3379. ↑ a b Doyle, M. P.; Westrum, L. J.; Wolthuis, W. N. E.; See, M. M.; Boone, W. P.; Bagheri, V.; Pearson, M. M. J. Am. Chem. Soc. 1993, 115, 958. ↑ Pirrung, M. C.; Liu, H.; Morehead, A. T., Jr. J. Am. Chem. Soc. 2002, 124, 1014. ↑ Nakamura, E.; Yoshikai, N.; Yamanaka, M. J. Am. Chem. Soc. 2002, 124, 7181. ↑ Doyle, M. P.; Westrum, L. J.; Wolthuis, W. N. E.; See, M. M.; Boone, W. P.; Bagheri, V.; Pearson, M. M. J. Am. Chem. Soc. 1993, 115, 958. ↑ Doyle, M. P.; Dyatkin, A. B.; Tedrow, J. S. Tetrahedron Lett. 1994, 35, 3853. ↑ Scott, L. T.; Minton, M. A. J. Org. Chem. 1977, 42, 3757. ↑ Ye, T.; McKervey, M. A. Chem. Rev. 1994, 94, 1091. ↑ Doyle, M. P.; Dorow, R. L.; Terpstra, J. W.; Rodenhouse, R. A. J. Org. Chem. 1985, 50, 1663. ↑ Clive, D. L. J.; Daigneault, S. J. Org. Chem. 1991, 56, 3801. ↑ Doyle, M. P.; Zhou, Q.-L.; Dyatkin, A. B.; Ruppar, D. A. Tetrahedron Lett. 1995, 36, 7579. ↑ Doyle, M. P.; Davies, S. B.; May, E. J. J. Org. Chem. 2001, 66, 8112. ↑ Doyle, M. P.; Yan, M.; Phillips, I. M.; Timmons, D. J. Adv. Synth. Catal. 2002, 344, 91. ↑ Doyle, M. P.; Protopopova, M. N.; Winchester, W. R.; Daniel, K. L. Tetrahedron Lett. 1992, 33, 7819. ↑ Müller, P.; Polleux, P. Helv. Chim. Acta 1994, 77, 645. ↑ Barberis, M.; Perez-Prieto, J.; Stiriba, S.-E.; Lahuerta, P. Org. Lett. 2001, 3, 3317. ↑ Minami, K.; Saito, H.; Tsutsui, H.; Nambu, H.; Anada, M.; Hashimoto, S. Adv. Synth. Catal. 2005, 347, 1483. ↑ Doyle, M. P.; Hu, W. Chirality 2002, 14, 169. ↑ Doyle, M. P.; Duffy, R.; Ratnikov, M.; Zhou, L. Chem. Rev. 2009, 110, 704. ↑ Hazen, G. G.; Weinstock, L. M.; Connell, R.; Bollinger, F. W. Synth. Commun. 1981, 11, 947. This page was last modified on 5 September 2013, at 03:21.